HOUSTON— Football is king in Texas. 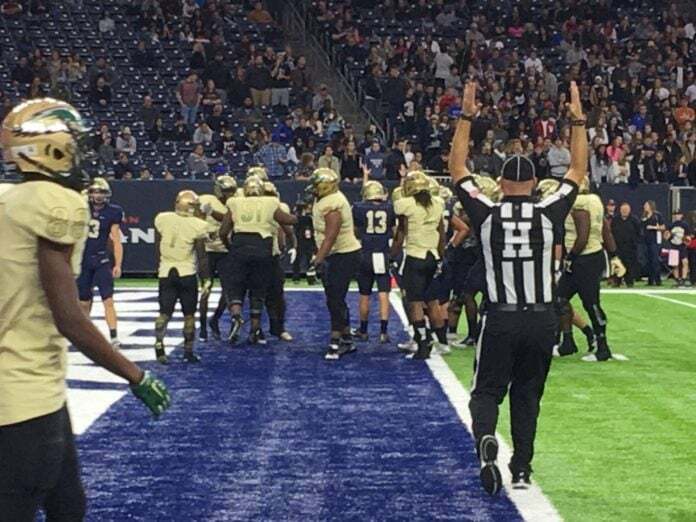 The DeSoto Eagles football team is now in a position to reign, after a comeback victory over the Klein Collins Tigers in the Class 6A-Division state semifinals Saturday. 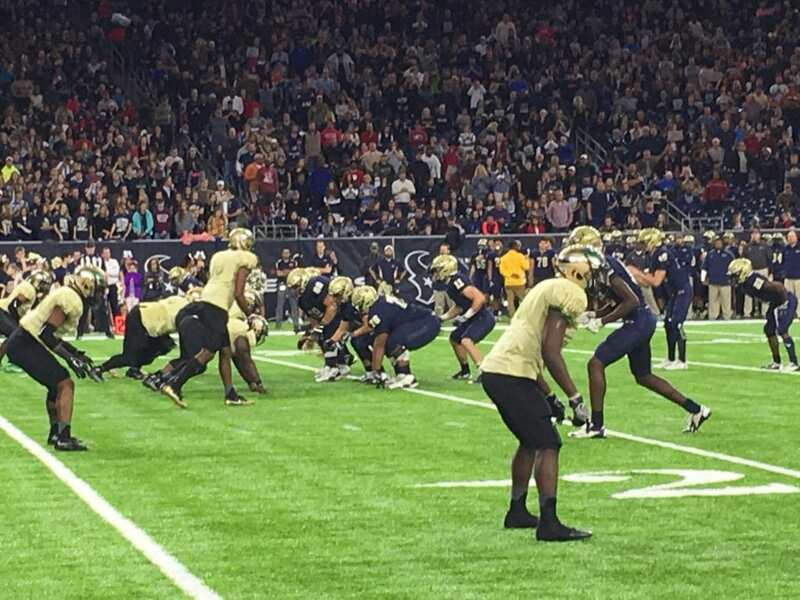 Early in the game, fans who had made the four-hour trip from DeSoto to Houston’s NRG Stadium had reason to sit on the edges of their seats in anticipation. A come-from-behind victory last week in Abilene was cause for hope, but no one wanted to be denied as they were back in the 1990’s when Ben Dial’s Eagles, led by eventual pro-player Brian Hanspard, fell before reaching the final state pinnacle. The first two drives for the normally high powered DeSoto Eagle offense resulted in no first downs and a meager eight yards. Quarterback Shawn Robinson failed to connect with his receiving corps. Reason for optimism grew in third possession of the game when Robinson completed a pass to Wide Receiver K.D. Nixon for a first down. Robinson then abandoned his passing strategy for a quarterback option. He broke free for a 25 yard jaunt to the 43 yard line. Finding success on the ground, Robinson took matters into his own hands again with two consecutive rushes. This brought the Eagles to the 25 yard line. The TCU commit attempted another return to the airwaves, but with no success on his first pass to Nixon. Then he sought out Wide Receiver Emmett Perry and connected at the nine yard line. Now within the red zone, Robinson avoided risking an interception, handing the ball to Running Back Kelan Walker. Walker darted into the end zone, surprising the Klein Collins defense who had been deep in the endzone, anticipating another pass. 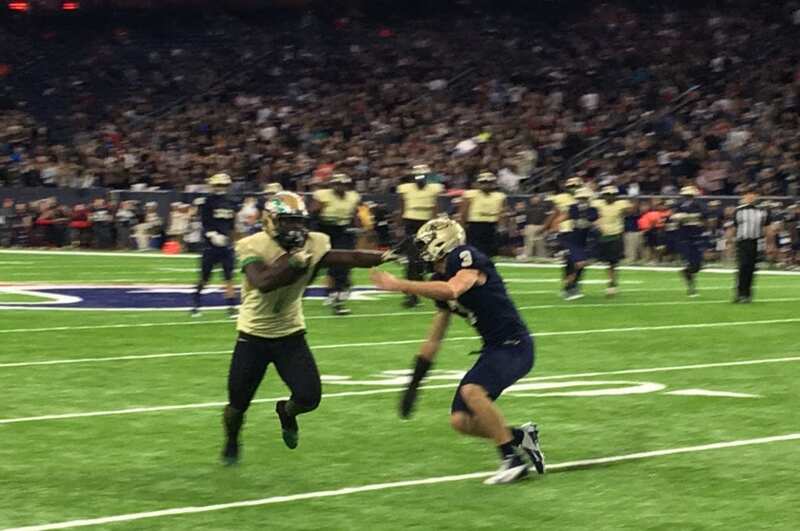 The DeSoto Eagles were back in the game, tying the game at 7-7. Klein Collins’ Bryson Powers added another touchdown in the second quarter and a Jon Bucio kick gave the Tigers a 14-7 edge. The Eagles came back to tie the game again on a Richie Washington dive over the goal line and a Christian Gonzalez kick. The rest of the half belonged to the Tigers. After two more touchdowns and extra points they closed the half at 28-14. With 5:49 remaining in the third, the Eagles Shawn Robinson narrowed the Tiger lead with a 42 yard run. Gonzalez kick tightened the game to 28-21. A Jon Bucio field goal added three more for Klein Collins to close out the third at 31-21. With Seven minutes remaining in the fourth, the Eagles turned white hot. The defense shut out the Tigers for the rest of the game while the Eagle offense came alive. Richie Washington scored on a five-yard run and Gonzalez added the PAT to bring the Eagles to within three. Outside Linebacker Ashton Brooks returned a fumble 42 yards for a score with 7:46 remaining in the game to give the Eagles their first lead of the game. Then, on Klein Collins’ next possession, Free Safety Isaiah Stewart picked up another fumble, and returned it for another score. With Gonzales kick, DeSoto had a 42-31 cushion en route to a huge semifinal victory. The interceptions didn’t end there. With 5:36 remaining, Junior Cornerback Gemon Green picked off an interception in the end zone dashing a Tiger comeback hope. Four minutes later, Byron Hanspard Jr. picked off another pass. At that point, the game clock ran free. Pandemonium erupted on the DeSoto sideline. Head Coach Todd Peterson was ceremoniously drenched by players, green flags flew and the noise was deafening. DeSoto returns to AT&T Stadium and will face Cibolo Steele Saturday, December 17 in the 6A-Division 2 State Championship game. The Eagles last faced Steele last September when they fell 35-32, in a non-district regular season game. Tickets are available for purchase for $15 online through ticketmaster.com.